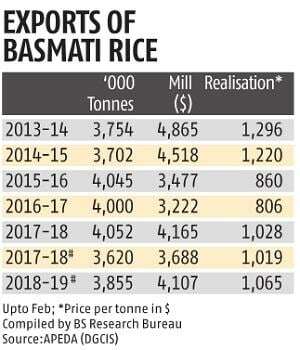 Basmati rice export is projected to hit a record level of Rs 30,000 crore or nearly $4.28 billion (at Rs 70 a dollar) this season. In addition, shippers are getting a higher realisation vis-à-vis their procurement cost. The largest exported variety, Pusa 1121, saw an average procurement price of Rs 35,000-38,000 a tonne in the current 2018-19 season, about 8.5 per cent higher than the Rs 33,000-35,000 a tonne in 2017-18. However, export realisation at Rs 74,000 a tonne in the first 10 months of this financial year (April 2018 to January 2019) was 14 per cent more than the Rs 65,000 a tonne in the same period of 2017-18. In these 10 months, basmati export has been almost $4.1 billion, about 11.4 per cent higher than the nearly $3.7 billion a year before. Rating agency Icra notes the export volume is only marginally higher at two per cent, while realisation is 14 per cent higher. Over the next few quarters, goes the forecast, export market demand would remain steady, supported by resumption of import in the key market of Iran. Icra assistant vice-president Deepak Jotwani says the growth had occurred despite some challenges, such as the pesticide residue issue leading to a fall in shipment to the European Union (EU), Saudi Arabia mulling adoption of stringent pesticide rules, payment issues with Iranian importers and uncertainty due to imposition of trade sanctions on Iran by the American government. Kohinoor Foods joint managing director Gurnam Arora told Business Standard the export market was steady and shipment to Iran had been growing. However, he felt, total export this year would be lower than the previous season’s four million tonnes. Basmati paddy prices have ruling high over the past two financial years, 2016-17 and 2017-18. In the current season, production is five per cent less as some farmers had shifted to non-basmati varieties due to a considerable increase in the minimum support price (MSP) for these. Also, there was untimely rain in key growing states. As a result, paddy prices rose over 10 per cent across varieties. The increase in average realisation is likely to sustain in the first half of 2019-20, owing to the increase in paddy costs in the recently concluded procurement season and a steady international as well as domestic demand outlook, Icra says. India Rice Exporters Association (AIREA) executive director Vinod Kaul said higher realisation for farmers could result in more sowing the coming season, although this is some months away. “Beside, production of basmati would depend upon good monsoons, since paddy is basically a water-flooded crop and good rainfall is key to output,” he said. 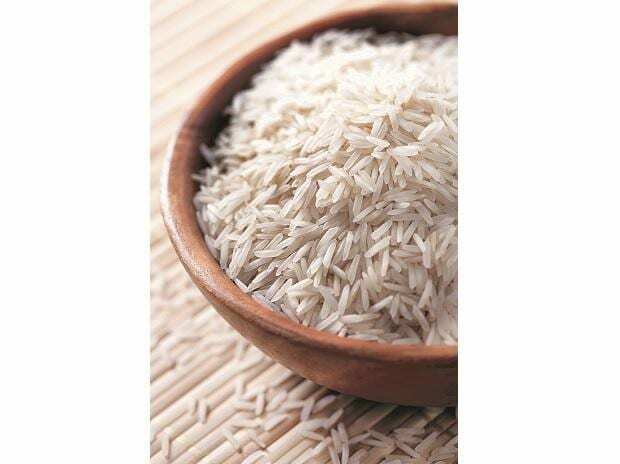 “The West Asian markets have seen good demand for basmati this season. Beside, the sector has emerged from the initial hiccups of demonetisation and implementation of the Goods and Services Tax,” says Mumbai-based rice exporter Devendra Vora.